If you’re the kind of traveler who loves to experience local flare, then Forest Grove’s extensive calendar of annual events should evoke some pretty strong interest. After a flurry of planning in January and February, the city’s festival season kicks into gear in March with the Annual All Northwest Barbershop Ballad Contest where the best singing groups in the region compete at Forest Grove High School. April finds the city swaying to an island tune when Pacific University’s Hawaiian Club hosts their annual luau, drawing more than 2,000 people to the Forest Grove campus to celebrate the culture (and the food!) of Hawaii. Also in April, wine lovers flock to the area to sample new releases, savor wine and food pairings and learn about the winemaking process during the North Willamette Vintners Wine Trail Weekend. June celebrates the locals’ green thumbs during the Annual Spring Garden Tour of the best of the city’s gardens. 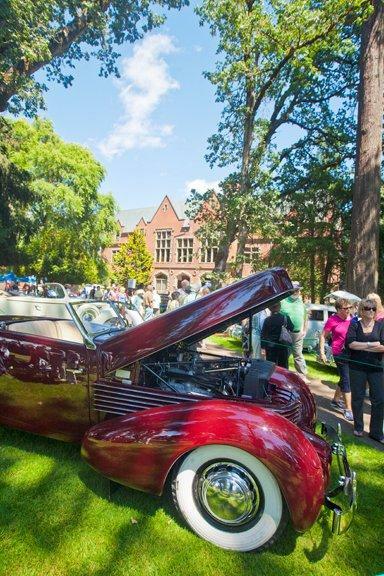 In July, auto enthusiasts roll on to the Pacific University campus for the Concours d’Elegance, a premier vintage car show featuring more than 300 classic vehicles as well as live musical entertainment and tasty treats. Food and wine connoisseurs will be popping up in Forest Grove in August for Uncorked, an event celebrating the best in local food, wine and micro-brews. Groups traveling with children should consider September’s annual Sidewalk Chalk Art Festival & the Annual Corn Roast and Fall Festival where organizers encourage one and all to “express the artist within” before heading over to the Pacific University Campus to savor some roasted corn on the cob. Also in September, history buffs can revel in the past during the popular Historic Homes Tour. The harvest season brings the Verboort Sausage Festival, always the first Saturday in November, with its traditional handmade sausage, sauerkraut and applesauce dinner made solely by hundreds of community volunteers and generations of families that have been in Verboort for over 150 years. Then the Christmas season begins with Holiday in the Grove, a schedule of events including breakfast with Santa and holiday music capped off by the Holiday Light Parade.